Happy Chrismukah or Chrisnukkah or Whatever. First and foremost, there was the thesis. Then there is the thesis topic over and over and over and over again. My God, do I not understand the meaning of "beating a dead horse"?! In addition to wild animals, I'm not so good with planes either. There was an unfortunate dabbling with hair dye. Not quite feared, but definitely questionable. Too much science makes a girl really, really boring. Cure: Morocco, Mexico, Japan and the much-more exotic Washington, D.C..
A fascinating discussion on evolution. 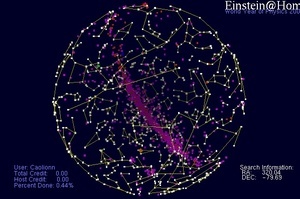 Hot topic: women in physics. Defense, a post-doc position, a new apartment and a return home. PRL cover publication and explanation. A new job and new minefields. p.s. The site will be here indefinitely, but comments will be closed starting January 1st. I did it and ... well ... now I'm done. From this self-examination I have learned one thing. Yep, just one. As it turns out, I'm not so special. In fact, I would say my life is downright common. Between my fear of wild animals to my thesis troubles, there was always a reader, or five, who had been in the exact same predicament. And I realize it is a bit cheesy to say, but it was nice to know I wasn't alone. So thank you for being readers and sharers. I have loved the company every step of the way. Sam and I are part of the growing contingent of dual-faith households. I am Catholic by tradition and habit, but not so much belief and Sam is adamantly Jewish, although not the temple-attending kind of Jewish. My mother, unlike me, is a church-attending Catholic and, as far as she's concerned, Christmas is THE holiday. We're forced to say things like "Happy Birthday, Baby Jesus!" and the like, so you can imagine just how seriously she takes this holiday. Not surprisingly, she was slightly disappointed to find out that yet another child of hers was in a serious relationship with a non-believer. Poor lady is 0 for 3. Her disappointment quickly switched to glee when I informed her that if we were to marry, we would always be at her house for Christmas. Mom is now a BIG fan of the Jewish boyfriends for Catholic daughters concept. I wish you all a very merry and happy Chrismukah or belated Winter Solstice or fill-in-the-blank. I think I have made my obsession with the iPod abundantly clear and I have also extolled the virtues of books on mp3. Give me anything which allows me to multi-task and chances are I would be hooked within the hour. For years I have been a member of Audible.com, but lately my pocketbook has been wearing a little thin so I have been cutting back on non-essentials. One may say my addiction to online shopping should be at the top of the list, but I haven't really found a cure for that problem so far. Back in the day before purchased my iPod, I used to check-out books on tape from the library. More often than not, I would get sucked into the book only to find out that Tape 8 was completely ruined and then curse the library for its oversight. To this day, I have yet to complete Tess of the D'Urbervilles. But the library was free, so I couldn't really complain. Now imagine my excitement to learn that the Pasadena Library System offers audio eBooks for download. No tapes and I don't even have to go to the library, just download and play. The selection's variety is not the same as Audible, but I don't have to pay a dime. What will they think of next? Come on, do your part and sacrifice a little CPU and help the search for gravitational waves. Not to mention, it has really cool graphics. Sorry about the problems we've been having since Friday. Typepad is going through some growing pains, but all should be back to normal soon. Caramel covered apples. One with nuts and one with chocolate. Chicken enchiladas and green corn tamales. Two plates. Those chocolates with hazel nuts. Three. Marshmallows in the shape of snowmen. A handful. I stole the bag for later. Mother's holiday frosted cookies. A handful. A cheese course. (My sister-in-law was in France and sent a care package). Someone's homemade sugar cookies. I am not a fan of sugar cookies, but they slathered the icing on real thick, so I ate those too. Maybe I should start thinking about whether or not I want to start training for a marathon. I don't get it. 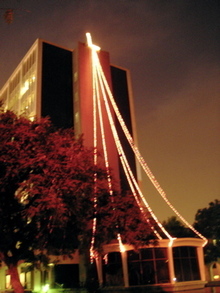 This is a picture of the main library on Caltech's campus dressed in lights for the holidays. I see the whole Christmas tree motif. Nice, standard, normal. I'm totally with them so far. But then they cap the tree off with an "L". Why? Am I missing something? Is there some meaning I should attach to the letter L and the holidays? I am totally drawing a blank here. Any ideas? Before I go home, I fill my blue folder with things I would like to read more carefully, stuff I need to edit and other small things that got overlooked during the day. Every evening, my blue folder never leaves my backpack, yet I am convinced that tonight will be the night I don't have something to do, no bills to be paid, no mess that needs to be cleaned, no show that I am dying to see. I always believe tonight will be different and I'll be able to do a little extra work. It seems I am always wrong, but I keep bringing the damn thing home. 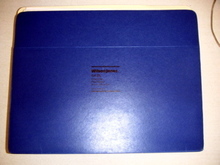 I am inclined to start leaving my blue folder at work, but I know the day I do that, I'll have nothing to do. So in the spirit of holiday cheer, Sam and I threw a party last Thursday. We thought it would be a simple, subdued affair to eat, drink and be merry. We thought wrong. Instead there was too much drinking, way too much merry, not enough eating and cops knocking on the door. Needless to say, the next day was spent cursing nature for not supplying us each with an extra liver because we clearly exceeded the limitations of the one provided. There was also the rather depressing realization that both of us still haven't learned the importance of moderation despite being what some would call "adults". I managed a rather spectacular recovery by late afternoon, whereas Sam was still refusing to eat and drink anything for fear of upsetting the delicate balance he achieved. After I went out to dinner with my sister, I called Sam to see if there was anything he was willing to eat or drink at that point. Perrier. He could handle a little Perrier. Because I am a firm believer that you're really only paying for the silent 'r', I recommended club soda instead. Despite being in the throes of a hangover, Sam was ready for a little experiment and thought I should pick up both so we could do a blind taste test. I am happy to announce, you're just paying for silent 'r'. I am also happy to announce, club soda really does help a hangover.